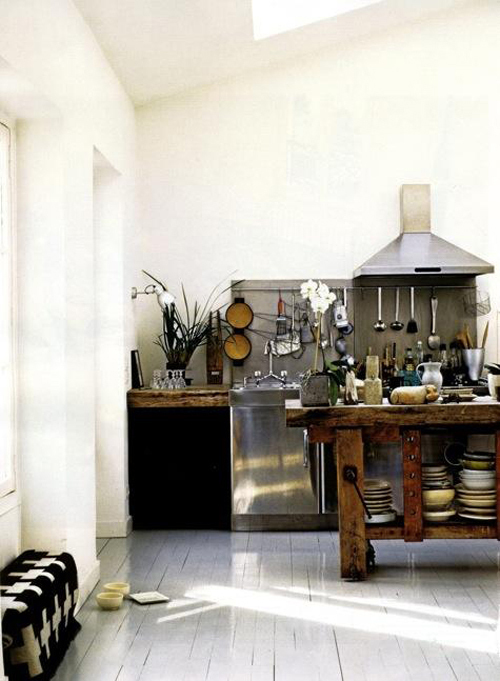 Just wanted to share a few of my favorite, less conventional kitchens for those of you who appreciate out-of-the-box thinking. 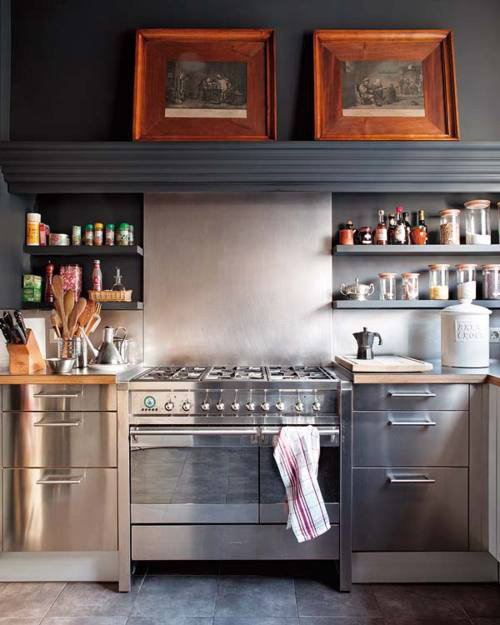 Cabinets without doors, pink walls, tool bench islands, oversized art, painted wood floors, stainless steel galore, and French-style armchairs around the dining table are just a few of the quirky elements that set these culinary havens apart from others. Love the wall color in that first one! Beautiful inspiration! Love all of these, especially the first two. 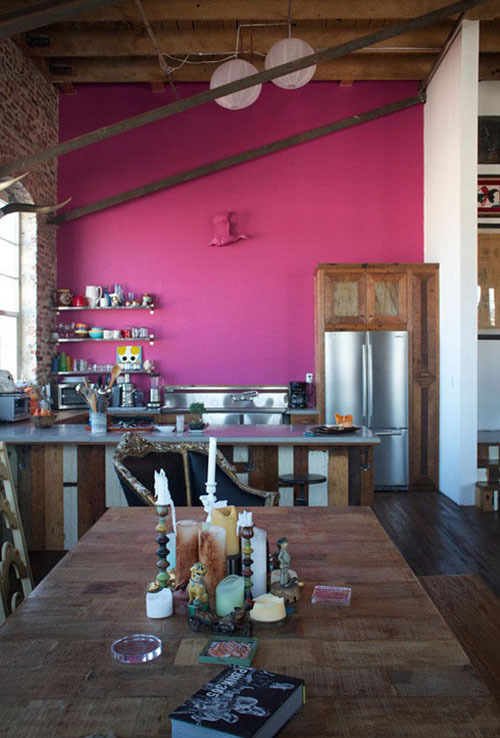 I love each and every one of those kitchens, but that pink wall is just screaming awesome! Wonderful, inspiring spaces! I actually featured the 3rd image on my own blog post about art in the kitchen. Love the oversized art in the 4th room! Man, that pink wall kitchen is on the money. 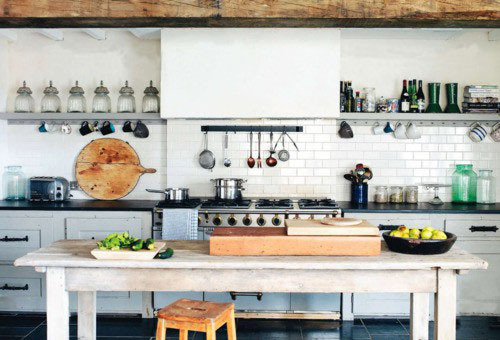 I'd love to French gîte with a kitchen like that because it would be so unexpected. Fabulous. I just love all the open shelves. I love the first and fourth ones!! 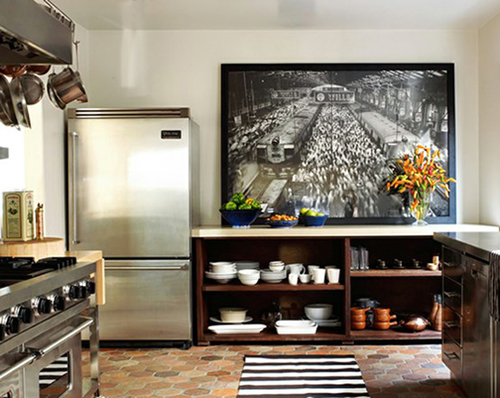 My favorite is the one withe the large scale b/w photograph and stripe rug. The first one with the pink is amazing, but I'm not sure I would have the guts to pull that off. Beautiful inspiration and Love the wall color in that first one. Thanks for sharing your precious comprehension with me..!